Since when do tortoises move sideways? In the three month’s following our last Slow & Steady check-in , we’ve made our least dramatic gain ever. 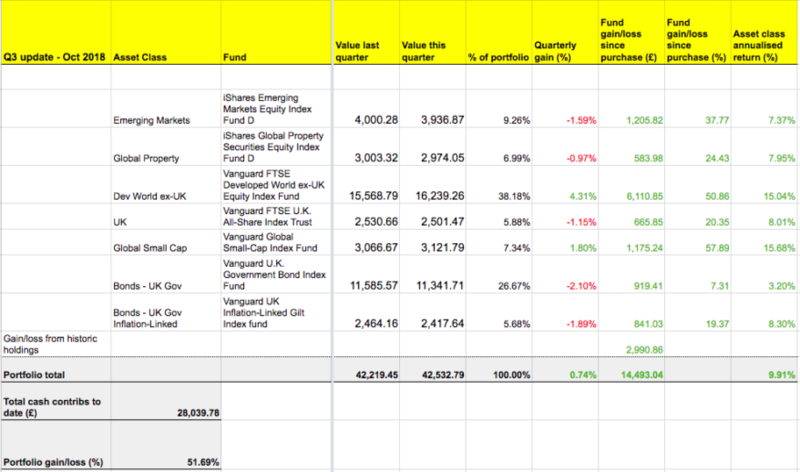 Our passive portfolio is up £313. Or 0.74% on last quarter. Hey, it’s better than a punch on the schnoz. Emerging markets are having a tough year, as are our government bonds. UK equities aren’t looking too chipper either, for some reason… The rest of the world is doing just fine, though, especially the US. The Slow and Steady portfolio is Monevator’s model passive investing  portfolio. It was set up at the start of 2011 with £3,000. An extra £935 is invested every quarter into a diversified set of index funds, tilted towards equities. You can read the origin story  and catch up on all the previous passive portfolio posts . Since we last spoke, there’s been lots of fanfare celebrating the longest bull market in history . And also why it isn’t the longest bull market in history . Confused? Is the end nigh? Either way, equity valuations  are high. Okay, US equity valuations  are high. Many other regions look fine. Just make sure you’re not overexposed to Belgium and Denmark . Ben Carlson of A Wealth Of Common Sense fame wrote a great post that encapsulates why high valuations are worrying . Yet worrying about it is as useful as sacrificing goats to save the harvest. It’s true that high valuations have historically been associated with poor returns over the subsequent ten to 15 years. You can expect a median annualised return of 2.2%  from US equities for the next decade and a half, according to Star Capital’s financial archeology1 . But expectations are not certainties. History shows the average return has ranged from 7.9% to -2.2% per year during similar periods when valuations have been frothy like a McFlurry in the mush. Other researchers are equally or even more pessimistic. The average US return could be -0.6% over the next ten years according to the expected return chart  of fund shop Research Affiliates2 . So are we like Wile E. Coyote after he’s run out of road and just before he looks down? Perhaps, but Ben Carlson’s post also quotes research concluding that you can do precious little  with valuation information. Valuations can warn you of hazards ahead. They can’t help you swerve them. You may have heard of asset allocation strategies that adjust for market valuations. For example Ben Graham, mentor of Warren Buffett, suggested trimming equities when they seem expensive. You could look to go to 25:75 equities:bonds when valuations are high, 50:50 when markets are fair value, and 75:25 when equities are a bargain. Taking action like that might make you feel more in control. There’s every chance it won’t achieve much though, according to investing luminaries Cliff Asness, Antti Ilmanen, and Thomas Maloney of AQR. Their paper  did show that a simple valuation timing strategy edged a buy-and-hold strategy from 1900-2015. But it hasn’t worked for the last 60 years. The result was a draw from 1958-2015. And that’s before counting the higher costs of timing. Valuations can drift higher or lower for years or decades, making it difficult to categorize the current market confidently as “cheap” or “expensive” without hindsight calibration, and therefore it is difficult to profit from such categorizations. There are also reasons to believe that measures of valuation such as Shiller’s Cyclically Adjusted PE Ratio (CAPE) may no longer hold sway. There may have been a structural change that keeps real yields low and inflation moderate for at least another five to ten years – perhaps a slowdown in equilibrium growth rate or a secular private sector deleveraging following decades of rising leverage. Or larger saving pools and investors’ better access to global capital markets at lower costs may have sustainably reduced the real returns investors require on asset class premia, and we’ll never see a reversal. If they don’t know, then I don’t know. Especially when plenty of other credible sources also advise caution on using CAPE to tame the bull or the bear. See these posts from Larry Swedroe  and Early Retirement Now  (ERN). If you think that today’s CAPE of 31.3 is high, would you have sold equities back in the 1990s at a CAPE level of 31.3? That would have been in June 1997 when the S&P 500 stood at 885 points. The S&P had another 79% to go before the peak (dividends reinvested). The best valuation metrics have historically explained  only about 40% of returns  anyway, according to Vanguard. Remember, too, we’ve been here before in this not-so-long bull market. For example, you might want to review a post  by The Investor from June 2014. He also found many pundits warning the US market was over-valued – but he suggested passive investors sit on their hands. The US market is up around 50% since then. So what to do? The main reason today’s post is a link-fest is because I wanted to put plenty of quality information at your fingertips – in case, like me, you’re prone to wondering when change must come. And after reviewing it, I can’t award myself a meddle. If you, on the other hand, must be master of your fate, then investigate overbalancing . It is a crude valuation timing strategy but a relatively benign one. In the face of a world beyond our control, humility is a good answer. If you don’t like that answer, then diversification is the other good one. The Slow & Steady portfolio is around 29% in US equities right now. If they flounder then we’ll look to fairly-valued Europe, the UK, and the Emerging Markets to carry on regardless. Every quarter we toss £935 down the bowling alley of global capitalism, hoping not to end up in the gutter. Our cash is divided between our seven funds according to our pre-determined asset allocation. This model portfolio is notionally held with Cavendish Online. Take a look at our online broker table  or tool  for other good platform options. Look at flat fee brokers if your ISA portfolio is worth substantially more than £25,000. The Slow & Steady portfolio is now worth over £41,000 but the fee saving isn’t juicy enough  for us to push the button on the move yet.